Thank you for taking the time to read this. Our family has a great need. In January of 2016, my husband of 37 years unexpectedly passed away. So for the last year and a half we have been on a journey of learning to live life with our new normal. It has not been easy. As of late, we had yet another crisis hit our family. Because of the nature of this crisis we had to secure a lawyer. I emptied out my savings account for the down payment bringing the bill from $136,000.00 to $111,000.00. Would you give towards our need? Thank you for your love, support, prayers, and generosity. Love you guys. Greater is He that is with us than he that is against us! Wanna hear a cool story? I just discovered today a certain amount of money was credited to one of my accounts & I didn't even have to pay a certain bill this month. That amount is going to you guys. Love you! Standing with you guys through this difficult time. Miss you and will be praying! Standing with you !praying for Justice! Thank You Lord Jesus for bringing another wave of giving to this delightful and deserving family. Thanks for all the words of encouragement and for staying faithful to Him! Standing in agreement with you in prayer! God will provide, He is faithful to you! Thank you Jesus for your people hearing your Voice, to give unto Your Heart's desire. Standing with you, praying for you! I will try to give more. I love you guys! May the Lord multiply this seed to a complete harvest for you! Me: "So Lord Jesus, What should I give?" The Lord: "$58, because blessings will pour out of My hand." Habakkuk 3:3-5 (KJV) "God came ... His glory covered the heavens, and the earth was full of His praise. And His brightness was as the light; He had horns [POWER] coming out of His hand: and there was the hiding of His power. Before Him went the pestilence, and burning coals went forth at His feet. Love you all and will give more as we can!!!!! 2018 is a new beginning for helping to reach this financial goal. Jesus, bless the Campbells with this need fulfilled. WE CALL YOU BLESSED AND YOUR NEED MET IN THE NAME ABOVE ALL NAMES!!!!! God bless you! He has not forgotten you! Jesus keep pouring your blessings on the Campbells! I had a dream last night that a particular person was set free, and there was great rejoicing with tears of happiness and celebration by many youth. For Jesus it's as easy as 123. 1 Corinthians 9:7 "Who at any time serves as a soldier at his own expense?" We stand with you all in the name of Jesus - and call this back to you 7 times! We love you! Believing God's promises... Your family is Good soil! more to come soon! What would we do if Jesus appeared visually to us and asked to help this Prophetess WIDOW? Hmm? No condemnation, just encouragement by faith. We’re in the same boat of being falsely accused and facing legal repercussions. Leviathan’s twisting spirit at it again. I’m sowing into your situation and ask that you pray for our situation as well. As one! I wish I had it all to give you! Bless you, Pastor Kathy and Charity. Miss you both. Go Lord go! Pour your mountains of blessings on the Campbells. As a widow, you have given much to others. Now it's our turn to give to you and your family. I wish I could pay off the total need. However, with all of us together, Jesus will pool His money, that sits in our pockets and accounts. God pour back many-fold into the givers. Our prayers and financial support are with you during this time of family crisis. We believe that God will supply all your needs and break open the pathway before you. The Campbells have blessed so many lives. Through all the challenges they face, they never quit! They are amazing examples of how to endure hardship like a good soldier. Their motive for all they do is pure, sincere, and always out of love. I pray they receive 100-fold plus of the encouragement and gifts they have given. We have known this amazing family for over 20 years, we love you ALL and stand with you during this challenging time! We're praying for you! We're so grateful to call you our Pastor and friend! I love you all. Praying. Love you all!! You're in our thoughts and prayers daily!!! I am praying that God opens floodgates of financial blessings all over your family in the days ahead. You have spoken into my life so many times. I appreciate you and your ministry. I pray this situation end soon for you! Praying for you. Thank you for all you’ve done for His Church and Kingdom! Remember Gideon's account in the Word! Love you. You have blessed me tremendously. Praying, all your needs are meet and more...blessings, blessings and more blessings to you and the family. My seed is going in the good ground and thank you for the honor and previlage to be part of an awesome testimony you will have and share in the years to come. Big Hugs!!! Health, strength, miracles, surprises, abundance, peace, courage, breakthrough! ❤So thankful for your faithfulness, willingness and extravagant generosity! God bless you as you face this challenge. Praying for God's provision and mercy on the situation. Love you! Jesus increase even the small donations from many people. Thank you Lord! Praying for breakthrough and peace! Praying the Lord provides for you and brings you His perfect peace. What a nice simple way to give to a very deserving family! We need $30,000 before the end of March. Would you consider helping us reach that goal? First of all, thank you for all who have been so supportive and generous! 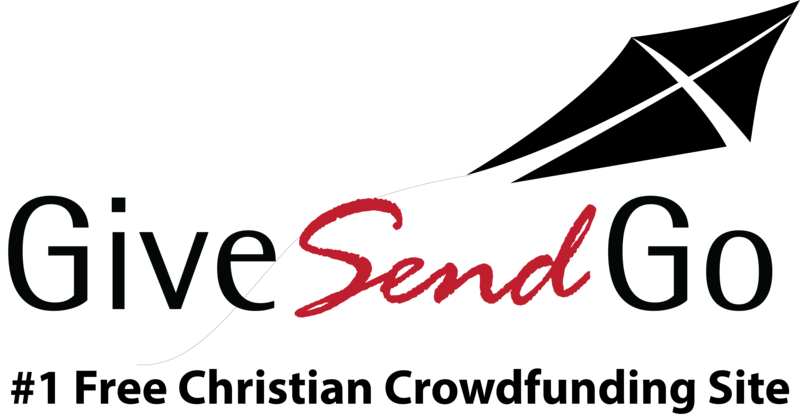 Our goal is $111,000.00 and we have raised $35,000.00 of that goal through checks and GIVESENDGO! Please consider helping us meet our goal.